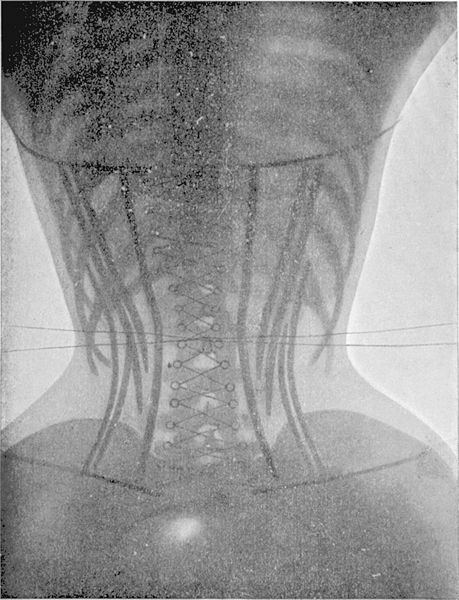 X-Ray images of women wearing corsets from the second volume of the French doctor Ludovic O’Followell’s Le Corset (1908). Although Dr O’Followell was clearly keen to show the damaging impact of corsets on women’s health, he did not actually want the corset to be abolished, but was simply trying to encourage a less severe design. Dr O’Followell in fact continued to write a regular column for the deluxe corsetier’s magazine Les Dessous Elégance. Diagram showing the corset’s ill-effects upon the ribcage. The bold lines (B and D) show the position of ribs and corset’s line before tightening; the dotted line (A and C) shows the new path of the corset and subsequent new position of the ribs after tightening.